Much has been made of the basic unfairness in how responsibility is shared between nations for ameliorating the refugee crisis. But the real question is the level of economic sharing that is needed to deal with its root causes, when the international response continues to be woefully inadequate. Following the first ever United Nations Summit on Refugees and Migrants last week, many civil society organisations and concerned citizens are taking stock of our government’s collective response to this unprecedented global crisis. The UN Summit was two years in the making, and gave a rare opportunity for world leaders to step up their commitments to help refugees, as well as draw up a blueprint for a more effective international plan of action. Central to these negotiations was the need to share responsibility for dealing with the crisis more equitably among member states, which was one of the key principles reaffirmed in the outcome document. Yet there is little promise for the world’s 21 million refugees that wealthy nations will be genuinely sharing—and not further shirking—their responsibilities to fulfil these vulnerable people’s basic rights. Before the summit convened, it was already clear that rich governments would not be placing the needs of refugees and migrants above their narrow national self-interest. Rights groups widely criticised the watered-down agreement adopted by the UN General Assembly, particularly a commitment to resettle 10 percent of the global refugee population annually (itself inadequate) that was later dropped from the negotiation text. Another omission was the hoped-for Global Compact on Responsibility Sharing for Refugees, which was intended to be one of the summit’s main outcomes. Instead, any chance of a global solution is deferred for another 2 years of negotiations. What remains is a long list of general and vague commitments, without any kind of binding mechanism or targets decided for responsibility sharing between nations. More concrete pledges were made at a separate Leaders’ Summit on Refugees, convened by President Obama with 50 other nations, who together promised to take in significantly more refugees this year and increase funding by $4.5bn. But even these promises lack a guarantee, and may be reneged upon by the United States in its next administration. So where is the hope that the situation can improve while 34,000 people are forced to flee their homes each day due to conflict and persecution, many of them continuing to die in an attempt to reach safety? The shocking trends show no sign of abating, largely driven by violent conflicts in the Middle East and North Africa that Western powers have had a substantial role in causing or exacerbating. Yet the responses we are seeing from governments are often far from the fundamental principles set down in international refugee law, as reaffirmed at the UN Summit. Europe is currently building more walls than during the height of the Cold War; billions of euros are being spent on deterrence measures and reactionary cooperation agreements that are having limited impact on the number of overall arrivals. Our own country, the UK, is admitting only a tiny proportion of Syrian refugees, while shamefully diverting part of the aid budget to control immigration from Africa. The new UK government’s position is that those fleeing war zones should remain in the first safe country they reach—effectively arguing that the refugee crisis is somebody else’s problem. It is not enough to question where is the hope, for where is the morality, the kindness, the basic compassion? In this era of growing polarisation, fear and prejudice, there are many ordinary citizens who stand in solidarity with refugees as they are forced from their homelands, stepping in with volunteering and rescue efforts where governments have failed. STWR joined 30,000 others as part of the “refugees welcome” march in London on the weekend prior to the UN Summit, calling on the British government to settle more refugees and provide safe, legal routes to asylum. The numbers of people gathered were considerably less than last year when 100,000 marched, thought to be the biggest national show of support for refugees in living memory. But among a population of 64 million, such a one-off event was never going to be enough to compel the UK government to accept its fair share of refugees, and play its part in forging strong multilateral action. The same situation pertains in other wealthy nations, where the majority of citizens turn a blind eye to the senseless suffering of those less fortunate than themselves. It has to be remembered that while 65 million people have been displaced by war or persecution, there are millions of others living in extreme poverty who do not have the economic means to seek refuge abroad, which may cost thousands of dollars to pay the fees of illegal human smugglers. What about the many millions of people who do not have enough food to eat on a daily basis, or the 22,000 children who die each day due to conditions of poverty? The global refugee crisis is the tip of the iceberg, compared to this wider tragedy of inequality and injustice that is seldom mentioned in news reports across the Western media. Yet even the problem of internally displaced persons—those who flee their homes but do not cross national borders, totalling around 45 million people—was ignored by the UN Summit. We are left to wonder at the fate of the billions of other people who live without adequate means for survival worldwide, so long as the lack of compassion in global policymaking is sustained by a generalised public indifference. Much has been made of the basic unfairness in how responsibility is shared between nations for ameliorating the refugee crisis, whereby only 14% of refugees are being hosted in the wealthiest parts of the world. According to analysis from Oxfam, more than half of refugees have been hosted by just 6 countries and territories that account for less than 2 percent of the global economy. But is this a surprise when we consider the lack of sharing that defines the planet as a whole, and the longstanding inequalities in living standards that divide the richest countries from the majority poor overseas? As Oxfam comment in their report “I Ask the World to Empathise”, the men and woman seeking a safer future have faced intense hardship, and will invariably have relied on the kindness and solidarity of strangers along their journeys, who may have shared their scarce resources with them. In contrast, most of the governments of affluent nations are failing to share their resources in the same spirit of common humanity. The real question is the kind of sharing that is needed to deal with the root causes of this unmitigated crisis, when the international response continues to be woefully inadequate. A coordinated multilateral plan of action based on the concept of responsibility sharing is the barest minimum that should be expected, in accordance with the capacity and wealth of each country. A massive upscaling of support is also required for the low- and middle-income countries who are hosting the most displaced people, so that response efforts can go beyond humanitarian aid to include help for livelihoods and education. All of these demands are entirely possible and realistic, if the right resources are directed at the problem. However, addressing the root causes of an economic order that constantly produces the drivers of mass human displacement—entrenched poverty, endless wars and worsening climate change—will demand a level of global economic sharing that is unlike anything we have seen since the foundation of the United Nations. 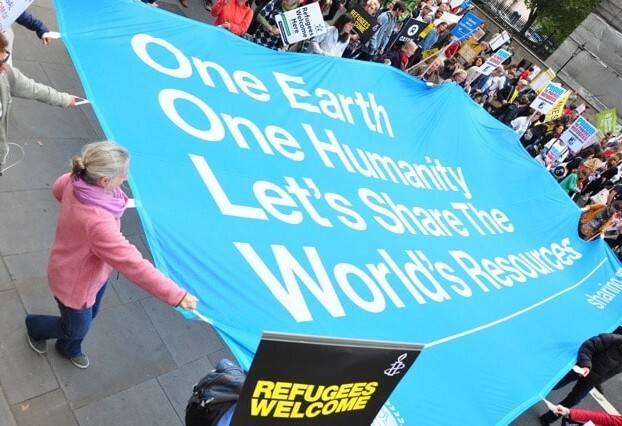 Only then can we realistically envisage a better world without borders, xenophobia or racism. So the fact that our governments have even failed to agree a new refugee protection system based on genuine sharing in any form, only serves to underline the obvious reality: that the true burden of responsibility lies ever more heavily on the shoulders of ordinary people of goodwill. Adam Parsons is the editor at Share The World's Resources.